Halloween is behind us and we only have 8 weeks left in this year! What are you going to do these last few weeks of 2013? I promised Steph (the lady that makes all my stuff look pretty and sound sane) that I would keep this one short and sweet as well. I am going to do my best! 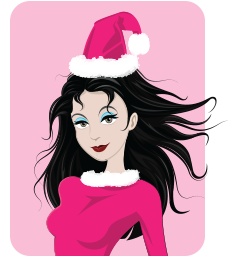 Come Rock Our Holiday Open House on November 21st! It’s party time! We are having a totally fabulous Holiday Open House, mark your calendars for Thursday, November 21 from 5pm until about 8ish. This year will actually be more like a huge party supporting a great cause. We will be teaming up with Abby’s Animal Angels for the month of November and they will be at the Holiday Open House with some furry, four legged friends looking for loving, forever homes. They are an amazing local rescue organization, and we want to help them any way we can! Come to the Open House November 21st and adopt a furbaby. We’ll also be collecting donations. They have an Amazon Wish List for needed pet food and supplies — Feel free to order and drop it off at the shop, or ship to us, or ship directly to them. Donate directly to Abby’s Animal Angels to help with vet bills and other medical expense for the animals they rescue. Like their Facebook page and spread the word about this great organization! Who else will be at our Holiday Open House? Did you know that the girls can do henna parties at your event? It makes for a fun birthday party, girls night out or baby shower! And yes the guys can get them done too. Why not really fire up your party and have the girls perform as well?! They are always a big hit. Two other friends will be joining us: Colleen with Colleen Brown Designs — love her jewelry work! And a brand new company from my friend Virginia, Earth Glow Candle Company. EarthGlow Candle Company products are created with natural soy and beeswax and scented with pure essential oils and natural fragrance oils. Of course we will have yummy food and our signature hot fruit punch. We will be having Door Prizes, Specials and we have a limited number of handcrafted items from Ecuador. Please share this with your friends — here is a pdf of the flyer — feel free to print off and share at your work, school or wherever! Thanks for your help! Bring a friend to the event who has never been to Raspberry Moon and you get to enter into the drawing an extra time. I stumbled across an article about people in certain areas of the world that live to be 100+. The article listed the 5 places that have the highest concentrations of centenarians — Okinawa, Japan (where my Mom lives! ); Nicoya, Costa Rica; Loma Linda, California (7th day Adventist); Sardinia, Greece; and the Isla of Ikaria, also part of Greece. This island is really what got me interested. 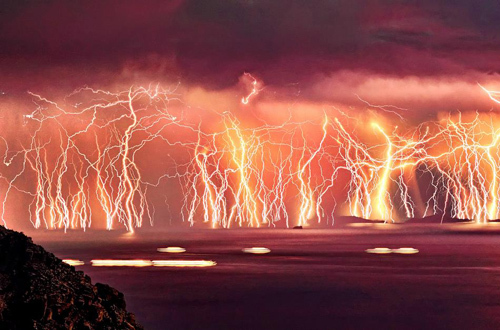 I had just seen the most awesome picture of a lighting storm and was already intrigued by the island. I think this picture looks like the Wrath of the Gods — kind of like the movie Wrath of the Titans. This picture put this island on my list of cool places to see. 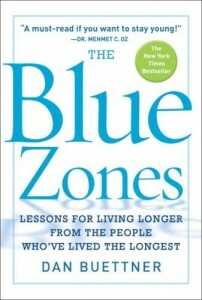 Then just a short while later it pops up again, so I went straight to Amazon and bought the book The Blue Zones: 9 Lessons for Living Longer From the People Who’ve Lived the Longest. Walk — I notice that in the US, I drive places I would have never driven to in Europe or South America. Part of it is I think we are always rushing and our society is set up to be lazy a little. In Germany it is hard to find a parking place and usually there are parking garages — you park and your car stays there and you walk in the Fußgängerzone — The Walking Zone so there are no cars. Make a date — Socialize while you walk. Figure out who you like to spend time with and go to it. You can always stop for a snack or drink (red wine is good for you in small doses) and keep moving. Enroll in a yoga class — heck yeah and of course you guys know who my favorite yoga peeps are, Greenville Yoga! Eat more slowly — I think this is a huge challenge. I eat way too fast. This makes you not realize when you are full and your stomach works so hard to break down your food. So slow down. Have a seat — eat with purpose and enjoy your food. Avoid Meat and Processed Foods (this doesn’t mean you have to be a vegetarian, more that we generally eat too much meat and need to consume less. According to Betsy with Pure on Main, beef can stay in our digestive track for up to a week before it is passed! Gross! Lead with beans — there are lots of kinds of beans out there so try something new — check out the Indian, Asian or one of the Arab stores for some interesting selections. Showcase Fruits and Veggies — put them on the shelf in the fridge or on a nice bowl on the table. Keep them front and center. 1 or 2 servings of Red Wine a day. If you can find Cannonau this is what the Sardinians drink. Explore a new tradition – if religion is not your thing then try something like a Unitarian Organization. Establish Rituals — family vacation, family dinner time at least once a week. Family Shrine — an area of the house that showcases your loved ones so even when they are not with us physically their love is still remembered and felt. Identify your inner circle – these will be family members and then friends who will support and challenge on your healthy mission. Don’t try to make yourself crazy doing these all at once…lol. Simply start out with 3 items you want to work on and go from there. You can check out http://www.bluezones.com/ for some great info, recipes and take a test to see how old you are. I have some work to do. My body is still a tiny bit under my age but they gave me a list of things to work on! It was pretty interesting. You might even see one of their recipes at the open house! Need a Sunday appointment? Slots are filling quickly! December 8th, 22nd, and 29th. Slight change of plans for the Christmas holidays. I’ll be in PA from Monday, December 23rd to Friday, December 27th. Shoopy (my grandfather) was recently in the hospital and I’ve decided to take an extra day to hang out with them for the holidays. Though I do need to find us something fun to do — I am thinking I should make everyone play that game Cranium. I can only watch so much Deadliest Catch, Moonshiners, Pickers, Storage Wars and Alaskan Survivalist! New Year’s Week I will be working every day but the 1st. 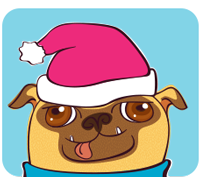 Please be advised, there are 7 weeks left between now and Christmas. I know, I know, but I am just saying…plan accordingly.